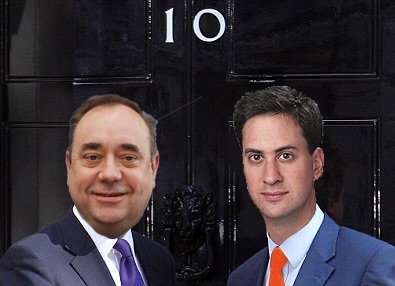 Why the SNP must hope that Labour can form a government without them. Sometimes, when the Conservatives want to float a particularly controversial idea, but don’t want to have their fingerprints all over it, retired party grandees are wheeled out to do it. Hence the contributions of ex Prime-Minister John Major and ex-Home Secretary Kenneth Baker to the debate and discussion about what Labour should do with the SNP after the election, should they be on a position where only the support of the Scottish Nationalist Party put them into government. Major suggested that Labour should have ruled this out already, given the threat to the Union of having to give in to SNP demands, and Baker went a step further, suggesting a “grand coalition” between Labour and the Conservatives to run the country after the May 2015 election, arguing that the future of the Union relies upon it. But I don’t think that will be necessary. I have made very clear in this blog that I have concerns about what would happen should the SNP have influence on the levers of power in Westminster. Their aims are pretty clear and transparent. It starts with Scottish independence, but it doesn’t end there. Whilst that is not possible every extra penny spent in the UK can mean extra spending on Scotland. So even if they are only supporting a Labour minority government on a vote by vote basis they could make it impossible to cut spending by voting against it and only vote for bills that raise spending. Having someone in a government so focused on the needs and wants of only 10% of the population is thus not really in the UK’s interests. Yet there is another way to look at this. If the SNP really hold the balance of power they will have one particular spectre hanging over them. One that has become particularly important given the restrictions on calling a new election that the Fixed Term Parliament Act puts on incumbent governments. Put simply, the voting down of a Budget or a Queen’s Speech will trigger 14 days of negotiations with the party in opposition gets the chance to form an alternative government. This, if Labour are in Government, could mean that the SNP not supporting their budget could put a Conservative government back in Downing Street. Think about that for a moment, the SNP’s main pitch in the Scottish referendum was that independence would mean a Conservative government could never ben imposed on the Scottish people from Westminster. If the situation above happens, a Conservative government would be imposed on the Scottish people by…the SNP. People seem to be forgetting as SNP politicians swan serenely over the UK’s TV screens, promising to be nice to anyone who lets them have their own way as long as it isn’t those beastly Conservatives (funny how the SNP wanting a lower corporation tax than the Conservatives seems to be irrelevant here), that they may actually be faced at some point with quite an onerous responsibility. However brilliant their politics has been over the past 8 years, and to so skilfully position themselves as a protest party in the UK after 7 years of Government in a scotland is brilliant, it is going to have be even better after May 7th to not actually hurt the hopes of the Scottish people. Given their leadership seems so sure that negotiation means telling the other side what you want and getting it, and that their idea of compromise appears to be a version of ‘if you give me what I want then I won’t punch you’, it will be very interesting to see whether being so close to power on May 8th makes them have to grow up. I still think the SNP will be best served long term by staying away from UK Government. But if the electoral Maths makes that impossible, they should hope that Labour can form a Government without them. If not, they are in more trouble than they think. « Spending targets or Results targets? Lessons from foreign aid.